Adam Forrester (b. 1980) received his MFA from the Lamar Dodd School of Art at the University of Georgia in 2013. His work has been screened and exhibited nationally and internationally as well as featured by NPR, the Bitter Southerner, and VICE Magazine. Adam has been documenting the bizarre reality found in the American South since he returned to the area in 2009. Eat White Dirt is Adam’s first documentary. 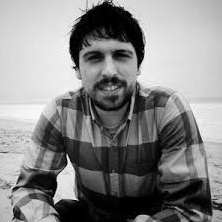 In 2011 Palmer Wallace produced the documentary, An Inconvenient Tax, and in 2013 he was the executive producer for the award winning feature film, Nothing In Los Angeles. Palmer has been a critical part of the Eat White Dirt since the early stages of the project as producer and, from time to time, production sound technician. Emily Wirt's experience by day as a LEED GA Interior Designer has cultivated a keen ability to expand creative ideas and facilitate their execution. In 2013, she was the costume designer for the short film The Stranger. Emily has also been with Eat White Dirt since the beginning as producer, sound technician, and all around glowing supporter of this project. Hailing from Milwaukee, WI and a graduate of Emerson College's Film Program, Jeff Jay began his editing career at The Whitehouse Post in New York. Jeff currently resides in Atlanta and is an editor and partner at Hero Post. Some of his clients include: SAP, Philips, Mitsubishi Electric, Florida's Natural, Bud Light and many more. Jeff joined the team early during the production stage and dove right into the project, eating some white dirt himself on day one. Billy Wirasnik is a musician, sound advocate and audio post-producer for film, radio, and interactive media. His most recent projects include sound design for the Peabody Award winning documentary project entitled Hollow, Movies of the Future, and a New York Times Op-Doc. Some of Billy's clients include: Marriott, Kodak, ZipCar, Old Spice, and the Boston Cyclist Union. Chuck Reece, Kyle Tibbs Jones, Dave Whitling, and Butler Raines are reviving storytelling in the American South. Delivering one long-format story every Tuesday, the Bitter Southerner covers everything from the Mardis Gras Indians to Memphis Barbecue and a host of other topics, including the age-old practice of earth-eating. The Bitter Southerner has been and integral part of sharing Eat White Dirt with a growing audience.